Oh that is so cute! I love the hat! this is going to be placed. Its perfect! s winner or favorite. So cute! OMGsh...totally agree with everyone...this photo ROCKS!! Great shot. He is the king of smirks and that is the smirk of all smirks! I love this photo! Wow....that is one fantastic smirk. I really love your entry! Love the DOF here and what a cute smile! shiver me timbers if this isnt the cutest! Cutie! Love the pirate hate :) Thanks for the comment on my blog! Now that's a smirk! Great shot! This is adorable. Wonderful clarity & color. Great capture! love that he has variations of smirk in his repertoir! He has the PERFECT smirk! Me matey is too cute! This is perfect!! so cute! 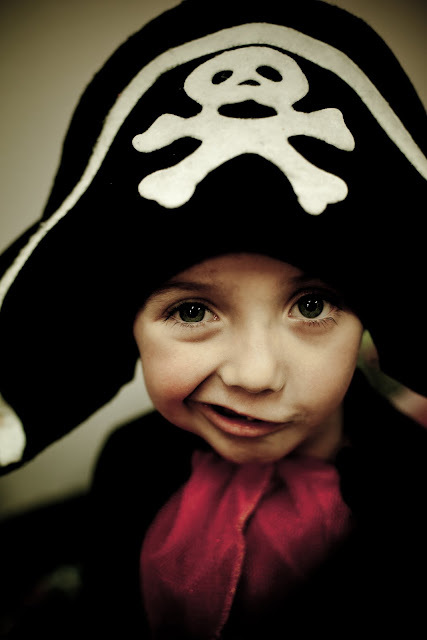 That is the cutest little pirate I have ever seen!